Investing for the future, one penny at a time. I did it! I contributed the full $5,000 limit to my Roth IRA for 2008. I didn't think I would be able to pull it off after the disaster of my layoff, but I managed to scrimp and save and it all worked out. 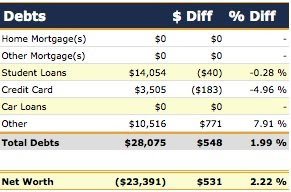 A priority for this year is to again max out my IRA for '09 - after this the limit will be increased by $500/year according to inflation, which is excellent. 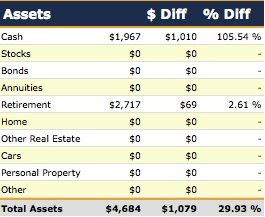 I now have more assets, specifically retirement assets, than I've ever had before! I think I may have lost my 4 readers, but hi again folks! I've been very busy with my other personal blog and I've been neglecting this one, although I've also been voraciously consuming financial and investing news and information over the last few months. I've discovered some excellent resources. I've thought a lot about this blog as well - what exactly do I want it to be? I think moving forward, while I will still track my finances as a measure of public accountability and because I like cool graphs, I think I will be concentrating more on investing and financial/economic news than personal finance. Over the past year and change I've learned a great deal, but I have the basics of my financial foundation down. Now my primary focus is to make my money work hard for me. I'll be talking about my experiences and what I learn along the way - and hopefully get some help from others once I get a few more eyeballs over here. I'm still unemployed - my company closed back in January. So my immediate goal right now is to find new employment. So far things are ok, however, as my emergency fund, cutting way back on expenses, and the unemployment benefits have worked out well. Family and friends have offered to help but, while I certainly appreciate it, I'm glad I don't have to rely on them anymore. Trust in American business, buy cheap, and hold forever - that's why this is a great time to invest in the entire stock market through index funds. John Bogle has a great opinion piece in today's WSJ about six lessons for investors. Fairly simple, straightforward, and logical - what good investing is all about. Financial guru Suze Orman is offering a free pdf download of her book here until January 15th. I haven't read it yet, but I recommend downloading it and then checking it out - why not? 2008 was an incredible year for the United States, the world - and of course me personally. I achieved a lot in terms of improving my personal finances. I learned a great deal since I started this journey last January, and it's amazing to think how far I've come and how far I have yet to go. It's an exciting, difficult, but positive journey and I can't wait to see what the future brings. $0 - The amount I paid in bank fees this year. A key reason for this was switching most of my banking to ING, but I also didn't overspend my checking account as I had regularly in the past (to the tune of $2,633 in overdraft charges, late fees, and service fees, which also happens to be close to my current IRA balance). 3.598 - This is the amount of shares I automatically purchased through dividend reinvestment in my FFNOX fund. Even though this is a tiny amount - purchased around $19 per share - this represents the first real example to me of true passive income beyond piddling savings account interest. Simply by owning these equities, I earned dividend cash that gave me something of additional value (in this case more shares). This was a big moment for me conceptually as a beginning investor. 12 - In the last year - just 12 short months - I have increased my knowledge of investing, the economy, frugality, retirement planning, and everything having to do with personal finance infinitely from where I was back in December in 2007. 57 - The number of personal finance blogs and websites listed on my sidebar. You were all extremely helpful, positive, and informative, and I know that my journey would have been much, much more difficult without your daily advice filling my Google Reader. And this is not to ignore the innumerable members of the Snowflake Revolution, whose dedication to strategic debt reduction and saving is truly inspirational. $1,000 - It's a nice round number to use as a first goal for everyone's emergency fund, which is a personal finance must. I built my EF up to $1,000 earlier in '08, emptied it for what I feel was a great reason, and am glad I currently have it sitting at $907. $2,501.72 - This is the amount that I used to buy into my first-ever investment in the stock market, the FFNOX index fund in my Fidelity Roth IRA. A banner day. $3,342.25 - This is the amount that I paid in debt reduction for the year. $4,684 - This is my current total assets. Considering I had literally $0 for years this is an infinitely fantastic improvement! $28,076 - This is the total debt that I finished the year with, which is actually $873.25 more than a year ago. Though some of this can be attributed to the interest on my student loan, the majority of it represents additional debt incurred by me. This is one significant disappointment for the year and something I have to concentrate on further in '09 and beyond. Kevin over at 20smoney is having a contest in which he's giving away an account at GoldMoney.com worth $250! Kevin is a big advocate of investing in gold - something in which I've become increasingly interested - and he's using this contest as a way to help others get into the gold game. Go on over and check it out. Could 2009 Be Better Than You Think? Five reasons from Alan Murray in the WSJ why it might very well be. Well. It's been some time since I blogged about my financial progress on here. I'm not entirely sure why; I think I got burned out a bit from taking in too much financial media, then the historic election, I was busy with various other things...at any rate I'm back to being focused on my personal finance and the economy in general. 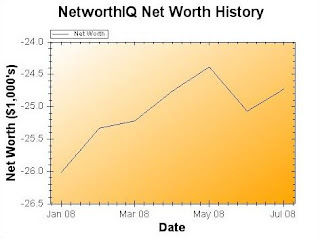 I finished up the year with a great month on the face of it: a 2.22% increase in my net worth. This was due to a big increase in assets by way of a healthy dose of Xmas cash, other savings, and small FFNOX dividends. This is bloated a bit, as I have close to $400 earmarked for specific debt reduction this month. Still, a solid month for asset accumulation. And then we come to my debts. Loans down as usual, cards down even more (representing reduced rotating monthly payments - I don't carry a balance aside from about $2600 in collections from years ago that I'm paying off at 0% interest), but that persnickety Other category is way, way up! +$771! Ugh. Part of this is that I haven't paid off NSTAR just yet (I'd rather hang onto the cash until the last possible moment. Psychological I suppose.) Part of it represents a few small family and friend debts that I seem to keep adding despite my commitment to not do so. And a big part of it - $430.53 to be exact - is from a Commonwealth of Massachusetts Tax Assessment from 2005! Perfect. Just what I need right now. Unfortuately I can't help but think this is accurate as back then I had no idea what I was doing with my taxes. I have some recourse to appeal; I will have to take a look at my records if I even have them lying around. Need to concentrate more on debt reduction in 2009. 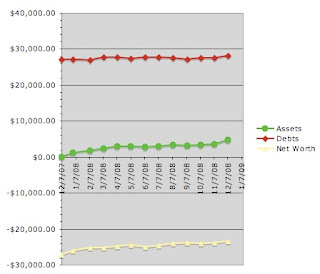 Because I like graphs that tell a great deal of information, I added a net worth line to my asset & debt graph. Here I can visually track my increasing net worth until it hits the point where the assets and debt lines cross (in the far, far future) - positive net worth. Not sure yet if this is cool, helpful, or silly. 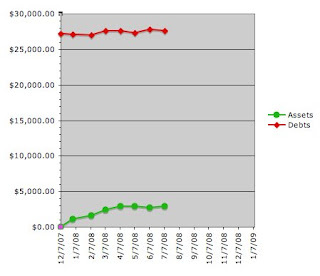 As you can see even though I increased my debts this month my big asset increase still resulted in a net worth increase. Because I like to pack as much info as possible into one graph, check out this new one! 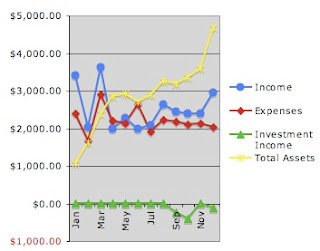 It's my FIP, or Financial Independence Progress, graph. A laughable concept right now to be sure, but I love tracking this stuff. I added a line that tracks my assets on here. The thing is even in those bad September and October months - and they certainly affected my equity positions - I was nevertheless able to build up my total cash assets. And the other excellent thing, and big reason for my asset jump this month, is that I was able to take that big income spike and turn it all into savings. I even decreased my overall expenses a bit. So the trend shown here is actually quite good. Does Unemployment Count as an Emergency? On December 30, 2008 I found out that I was getting laid off with the rest of my company (I work for a very small ad agency). We were simply hit by the perfect storm generated by our current economy: current clients cut way back on marketing budgets, dropping our projected billings for 2009 by over 80%; we weren't winning any new clients in the last quarter of 2008 as people were hesitating to take risks on new spending; we had a serious cash flow crunch for a few months as our receivables built up due to clients' inability to pay; we had to tap out our credit lines to make payroll and pay select vendors, who we had to string out just as our clients were doing to us; the nail in the coffin was Bank of America's refusal to extend our line of credit. Talk about feeling the effects of the recession directly. It was disappointing but no big surprise, as we saw the writing on the wall for some time. I thought we had a few more weeks to try to get back to good cash flow, but apparently things were even worse than I thought. The good thing is that I will be able to work on a part-time basis as my boss isn't filing bankruptcy just yet - we have ongoing projects, there is still work to be done albeit on a very limited basis, and we have opportunities still on the table. With a big new biz push and a little luck the company might be able to bounce back from the brink. So I will have enough coming in to live on as I look into other options for employment. But even before I had worked out this retainer deal with my boss, I felt a strange sense of calm. The reason? My savings. Even though I have a relatively small amount tucked away (about $1,600 including emergency and other savings), it would be enough to get me through the next couple months after January assuming other work and/or unemployment was delayed or hard to come by. (I also have my Roth, which can technically function as an emergency fund to a certain degree from what I understand, but I'd like to consider that untouchable for now). I know I would have been panicking otherwise if this had happened back when I had $0 in savings. So, in case you haven't yet taken it to heart: establish an emergency fund now for that unexpected emergency! NEW $25 ING Direct Referral Bonus Links! Earn up to $525 in bonuses from ING Direct! ING offers a $25 bonus if you open either a Savings or Checking account and you can refer up to 50 friends for $10 bonuses each - that totals $525, a fantastic return on your money! I have plenty of referrals left for both ING Direct Savings and Checking Accounts. ING is super easy to set up and use, with the ability to set up auto-deposits, sub-accounts for specific savings goals, and a fantastic referral program allowing the effective initial interest rate off your money to be significantly higher than the 3.00% they offer. They have tremendous customer service as well. I have been using them since December 2007 and I love them. If you'd like to open an account, you can use one of the links below to open either a savings or checking account (only one bonus per customer). You will only receive $25 if you deposit at least $250 to open the account, and I will receive $10. Then you can spread the word and earn even more $! This tells the same story, but from a slightly different perspective. As you can see, my assets jumped up from $0 to close to $3,000 fairly quickly, then dropped a bit and have recently started gaining slowly. My debts have reduced slowly, then increased, then decreased slowly, then increased again, and now are decreasing again, slowly. Here I can see quite clearly the "flattening" of both my asset and debt lines. This is bad! My net worth won't be positive until the lines intersect - when I have more total assets than total debt. I need to work on increasing the slope of that green line while causing that red line to fall precipitously. Hard work, as always. But eminently doable. Simply a matter of discipline. Male; 28. On the road to financial independence. Welcome to my personal finance blog! Receive a $25 bonus for opening up a high-yield savings or checking account with ING Direct if I refer you! Email me at Impecunious.Investor@gmail.com for a referral request.